Shocking Video Shows Hungarian Camerawoman Kicking And Tripping Fleeing Refugees..
Pictures can paint a thousand words. That is why the devastating image of Aylan washed up on a Turkish beach is so powerful. Well these images of a camerawoman abusing numerous refugees will tell you everything you need to know as to why ‘migrants’ aren’t keen to remain in Hungary. A reporter for Hungarian Channel N1 TV can be seen in two separate pieces of footage kicking out at men, women, children, and whoever the hell she can reach by the looks of it. The fleeing group is attempting to escape Hungarian police, and a registration camp where they are being held before they can make their way to the more accepting lands of Germany and Austria. Classy move deliberately tripping a man who is carrying a crying child. What an example to set. In the second film she is seen kicking a man who tries to avoid her, and a child who has the audacity to run within kicking distance. 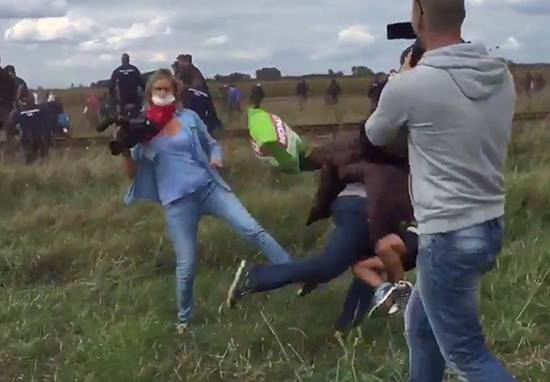 So a journalist places herself directly in front a group of fleeing refugees to ‘get the shot’, and then dislikes the fact that they inadvertently make minor contact with her? What was she expecting? If a few bumps is the price to pay for exploiting images of thousands of people in desperate need of help, she should count herself lucky. Yes Hungary is legally required to register refugees, but current systems are being overwhelmed, and the masses that have already fled persecution are still feeling persecuted. That is why they want to reach Austria or Germany and continue to fight in order to do so, and good luck to them. I hope they all reach a land in which they can build new lives, away from bottom-feeders like this camerawoman who was content to inflict further misery.